President Nana Addo Dankwa Akufo-Addo is still undecided on leading his governing New Patriotic Party (NPP) in the 2020 polls. According to Nana Addo, there have been moves by the NPP to get him to contest as the party’s presidential candidate in the 2020 polls. He however said he was yet to give a firm answer to the calls from the rank and file of the party. 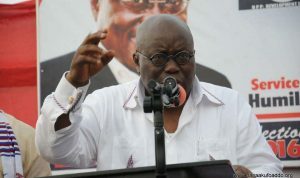 On December 7, 2016, then-candidate Akufo-Addo, on his third attempt to occupy the highest office of the land, led the NPP to its most significant electoral victory in history when he polled 5,716,026 votes, representing 53.9 percent of the popular votes cast, to beat the incumbent John Dramani Mahama, who garnered 4,713,277 votes, representing 44.4 percent of the votes cast. The President, who addressed the students and some of his former classmates during the visit, said his administration was working assiduously to put the country on the right footing towards development. The President, who completed his studies at the school 56 years ago, was invited to share his experiences with the current students and interact with some of his classmates, as well as his cricket and football teammates. He was the only Black student during his time and was affectionately called Billy by his peers. During the visit, President Akufo-Addo was taken on a tour of the school and was presented with framed group pictures of his football and cricket teams by his classmates, led by Sir Christopher John Rome Meyer, a former British Ambassador to the United States and Germany, and former Chairman of the Press Complaints Commission of the UK. The President said Ghana was the first country in sub-Saharan Africa to engage in the process of development. He said the current challenge to the country was an exciting and difficult one because the kind of decisions that were taken in Korea and China during the authoritarian regimes were not available to Ghana. President Akufo-Addo stated that the people of Ghana had stuck with the democratic path, open society, and government, respect for human rights and individual liberties for the past two and a half decades, and believed that development must take place within that context. Ghana, he indicated, had also led the continent in many spheres of development, particularly in the process of restoring democracy after several decades of authoritarian rule, largely military rule. He gave an assurance that the country would continue to lead the way in democratic entrenchment to attain the transition from poverty to prosperity. President Akufo-Addo described as offensive and unacceptable the posture of African nations with a cup in hand begging for alms in the midst of rich and abundant natural and human resources. He explained that if Africa’s untapped wealth, coupled with its position as a bread basket, was properly managed and judiciously redirected for the benefit of the people, the continent would assume its rightful place and engender the required progress and development. The President said the challenge of moving Ghana away from relying on handouts was one of the difficulties that had engaged his time and efforts. Answering questions from some of the students, he said his landmark free senior high school (SHS) policy enabled 90,000 more students to gain access to SHS education in the first year and 180,000 more students in the second year. On who his role model was, President Akufo-Addo mentioned the late South African President, Nelson Mandela, and explained that Mandela implemented what he pledged and that made him (the President) look up to Mandela. The President said strict discipline and the multi-tasking imbibed in him during his school days at Lancing had built him into a disciplined and hardworking person over the years. He explained that as the only Black person in the school at the time, interacting with people from diverse backgrounds on a common platform, exchanging ideas, attitudes and sentiments played a crucial role in shaping him to become a very accommodating politician. President Akufo-Addo said looking at the number of West Africans who had attended the school; it was time the school established its presence in West Africa. “Headmaster, I would have thought that there will be an arrangement to have a school in West Africa, at least in Ghana,” he said. Sir Christopher, in response, described their 1957 class as a “glorious class” and his classmate, President Akufo-Addo, as a fine mind, very intelligent and a person whose eloquence, clarity of speech and it made him stand out. He read portions of the 1961 copy of the school magazine which contained some of the works of the President, saying that was a testament to the mark of students from the school who continued to impact positively and impress society. The post I’m yet to tell NPP whether I’ll contest 2020 polls – Akufo-Addo appeared first on Citi Newsroom.